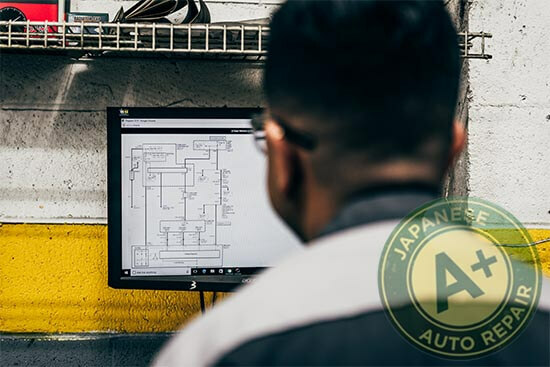 San Carlos Check Engine Light - A+ Japanese Auto Repair, Inc.
A+ Japanese Auto Repair employs expertly trained diagnostic repair mechanics trained on check engine light service & repair. Our facility offers same day check engine light repair & service. Industry trained check engine light diagnostic professionals. The Check Engine Light can be called many different things including the “Malfunction Indicator Lamp” (MIL) or the Service Engine Soon light. 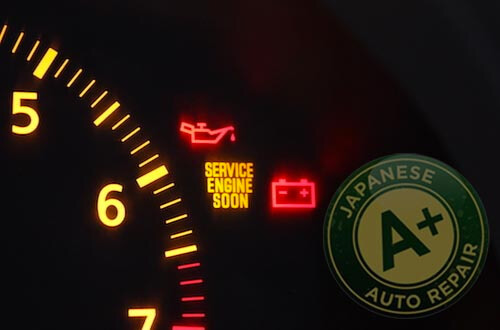 Nissan and Infiniti are the only vehicles that use the words "Service Engine Soon" as their check engine light. For the purpose of this article, we use the words "check engine light." Every time you start your vehicle, the check engine light is requested on for 3-6 seconds. This signal to turn on the check engine light is to test the check engine dash light bulb. 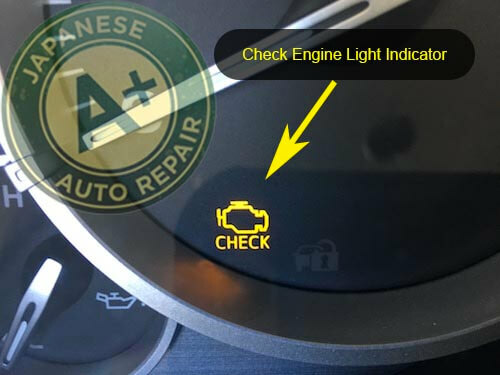 Once the car starts, the check engine light is suppose to turn off, unless there is a fault with the vehicle emission, computer control system, or transmission control system. Don't confuse the check engine light with the maintenance required light. The maintenance required light purpose is to alert the driver at a pre-determined mileage, the vehicle is ready for service. What Is A Typical Fault For The Emission System? The check engine light comes on to warn the driver that the emissions system is polluting beyond it's design limits. We have seen common faults such as a check engine triggered by a loose gas cap, worn oxygen sensors, catalytic converters that don't operate as they should and a multitude of other things. We always recommend to inspect your vehicles gas cap for a proper seal when the check engine light comes on as this creates a large evaporative system leak if it is loose. Other typical items that cause an emissions check engine light are cracked, damaged, disconnected rubber vacuum hoses that are related to the evaporative system. You can always bring it to A+ Japanese Auto Repair in San Carlos to make a proper diagnoses. What Sensors Turn On The Check Engine Light? There are between 10 - 50 sensors on vehicles that would turn on the check engine light. Each sensor is suppose to act and respond in a certain manner based on other sensors inputs including vehicle speed, engine RPM's, temperature, altitude, and acceleration. When the computer recognizes that one of these sensors is sending back a strange signal, it will turn the check engine light on to alert the driver there may be a fault. The computer will store which system caused the fault by using a computer trouble code for each fault. For example P0420: When our mechanics scan your computer to retrieve a code and receive a P0420 code it means your catalytic converter is not operating at maximum efficiency. This stored code could mean many things, a catalytic converter needs to be replaced, or there is a problem with your O2 (oxygen) sensors, wiring issues, computer damage, etc... A code gives our mechanics a starting point and from there we analyze each system or component related until we find the issue. A+ Japanese Auto Repair Inc. can diagnose the problem for you and in some cases fix the issue during the inspection. Figure A. shows the most common symbols used for check engine lights on todays vehicles. How Do I Check The Code That Turned On The Check Engine Light? On older cars, you can check the engine code by "jumping" two electronic pins which are vehicle specific, and the check engine light will flash a series of flashes. You then need to count the series of check engine light flashes and compare the codes to the vehicle specific code meanings. Vehicles 1996 and newer, pulling the code that requested the check engine light on is much easier. These newer vehicles have a universal connector called an OBD-II or OBD2 connector. That connectors has universal electronic pins and language that is mandated to speak with universal scanners. So, if you wanted to check the check engine light code yourself, you could purchase hand held scanner for $20- $30, find the OBD2 connector located somewhere between the front driver console to the front driver's door, and follow the directions on the scanner. One thing to remember is that the scanner will get you a code, it won't diagnose the cause. The vehicle is going to tell you that there is a symptom that needs to be diagnosed and then you need to test the components in that system. After you have changed the fault component, clear the check engine light with your scanner and go drive the car and make sure nothing else is wrong or was affected by the faulty part/system. Who Can Fix My Check Engine Light? A+ Japanese Auto Repair in San Carlos employs expert mechanics in check engine light repair near you. When there is a check engine light evaluation, we start with common check engine light problems, then look for TSB's (technical service bulletins), vehicle recalls, loose or disconnected components, then move onto component inspection. 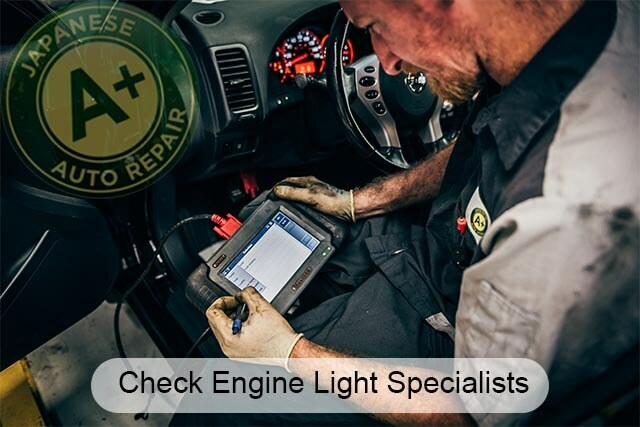 We have found that by inspecting our client's vehicles in this fashion we listed above, we have been able to save our clients significant money paid toward check engine light diagnoses. If you drive a Toyota, Lexus, Honda, Acura, Subaru, Mazda, Nissan, Infiniti, Hyundai or any other Japanese vehicles, A+ Japanese Auto Repair in the shop of choice for check engine light repair. If you have any further check engine light questions or would like some help with check engine light repair or service, please feel free to call us at 650-946-1856, text us at 650-750-8233, or make an appointment.